Leovigildo Miguel Giron was born in the Province of Pangasinang, Philippines, on the island of Luzon, August 20, 1911. He began training in the Filipino martial art of his family when very young and continued until the age of 9 years. 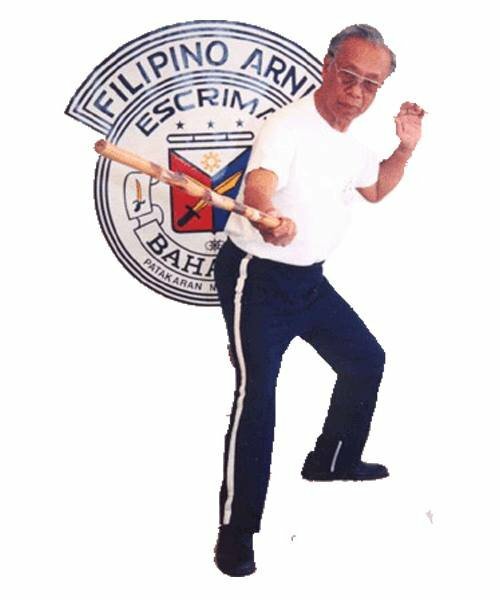 He was then given permission by his father to train with Master Benito Junio who was known for his expertise in Estilo Larga Mano (long range)and Estilo De Fondo (anchore position)later he began training with Master Benito’s uncle who was known for his expertise in Estilo Macabebe (double stick). At the age of 15 his family decided that Leo would be chosen to go the America to find success and to also provide a path for family members to follow. With only $3.75 on October 29, 1926 he set sail on the USS President Lincoln. After paying for passage and food, by the time he got to America he had 25 cents left to his name. Leo was met in San Francisco by his cousin who took him to Stockton, California to start his new life. His life started in the fields harvesting celery for 35 cents an hour but because he was very young most felt he shouldn’t get a man’s wage and had to settle for .17 cents an hour. This was not what he expected life in America to be like, but he persevered. As he migrated with the other farm workers he ended up in the prune orchards of Meridian, Ca. This is where he met his next instructor Master Flaviano Vergara in 1929. Master Flaviano Vergara was highly skilled in the Estilo Elastico. Master Flaviano Vergara emphasized the importance of having the knowledge a close quarter combat style,(Estilo Defondo) as well as the long range combative style, (Estilo Larga Mano). During World War ll he was attached to the 2nd Filipino Infantry Regiment and would later be assigned to the famous 978th Signal Group and The Allied Intelligence Bureau. This was a select group of men that served as secret operatives for General Douglas Macarthur. Sergeant Giron lead a group of American and Philippine soldier’s through the most hazardous conditions of World War II deep in the jungles of the Philippines. He opened his first school of Escrima in 1968 in Tracy, Ca. and years later in 1979 Leo restructured his Giron Arnis Escrima Club into an organized group with constitution and bylaws and now under a new logo as Bahala Na Martial Arts Association. Bahala na translates as “Come what may” or “Whatever will be, will be”. Leo decided to go abroad with the Giron System and created “Giron Systems International”. This took him to Germany and Spain and the system blossomed into a global renowned Filipino Martial Art System. The legendary Great Grandmaster, Leo Giron died on May 21st 2002 at the age 91. The Original Giron Escrima System uses a 36″ stick for long range sparring (most kali/escrima systems use 28″ sticks) and incorporates these 20 styles or methods of training.